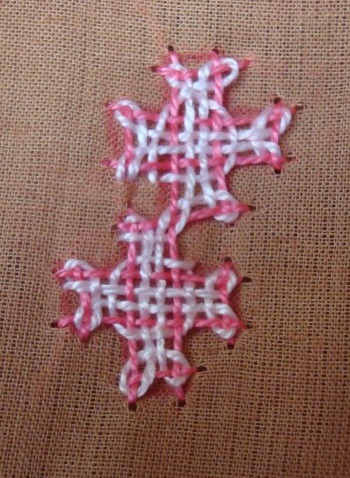 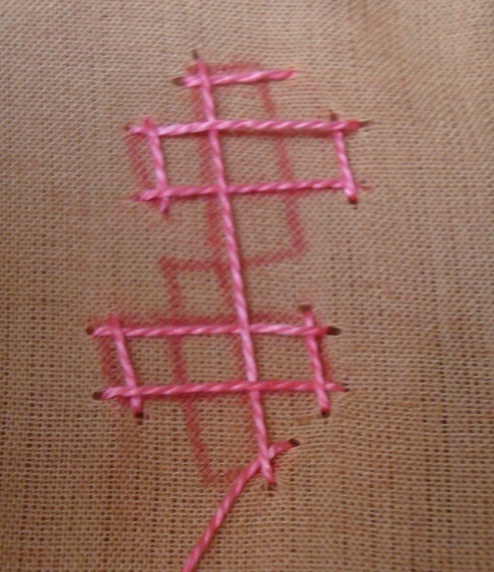 As requested, I am providing the instructions to work this trial pattern motif in woven kutchwork method. 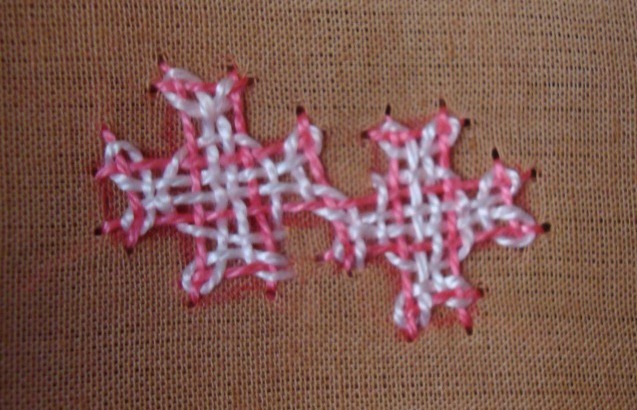 The drawn version of this pattern is big, and I have used pearl cotton for working this pattern- this is for photographic purposes only. 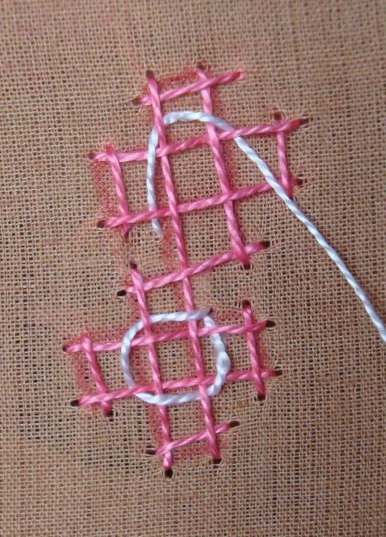 If it is worked in this way, it doesn’t look good. 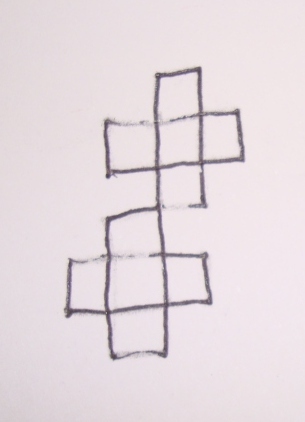 So, use this as a guide . 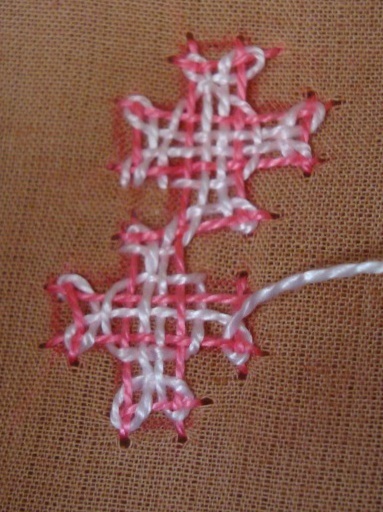 I also used two different threads – one for base stitch, another for weaving. 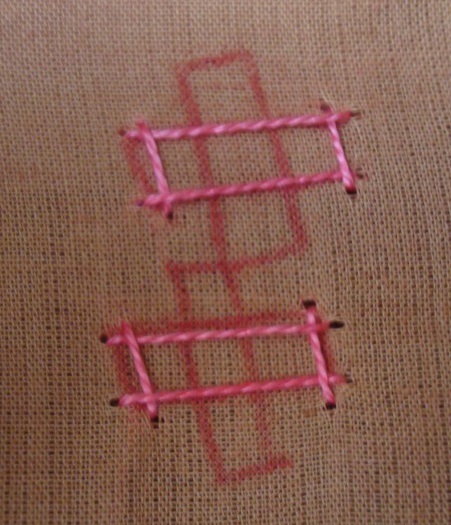 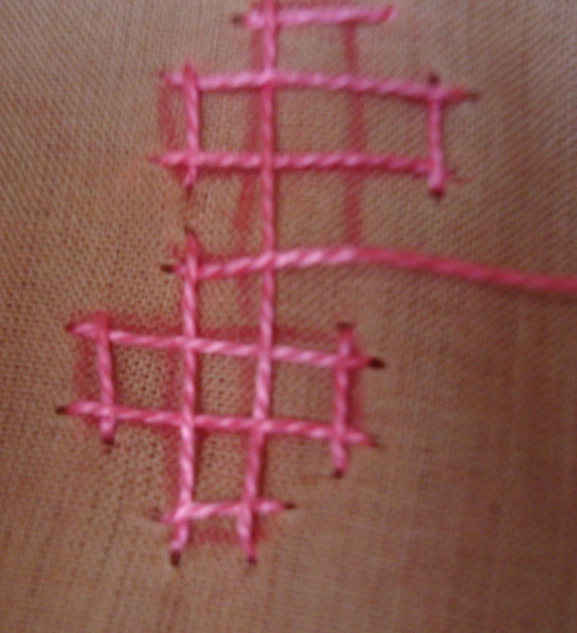 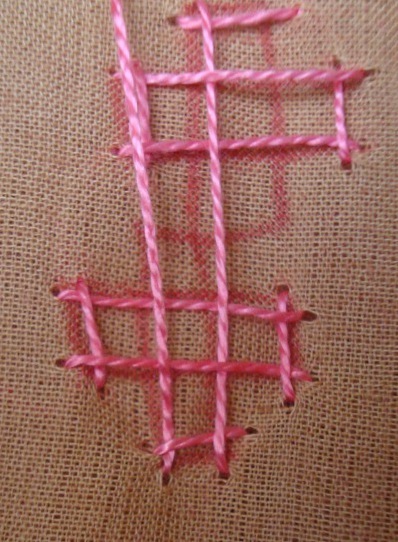 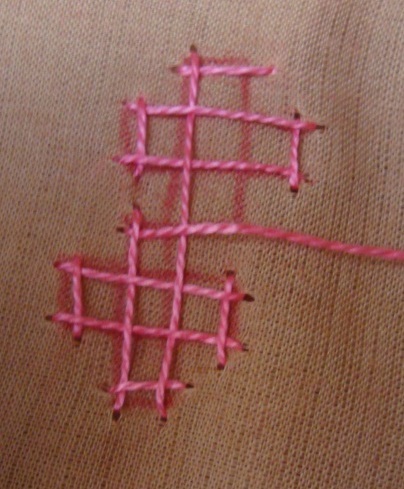 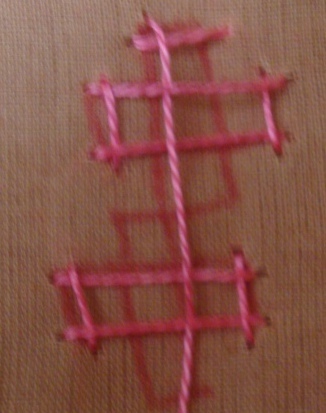 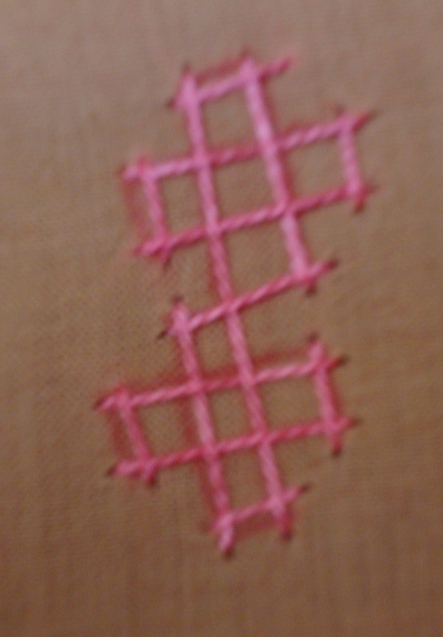 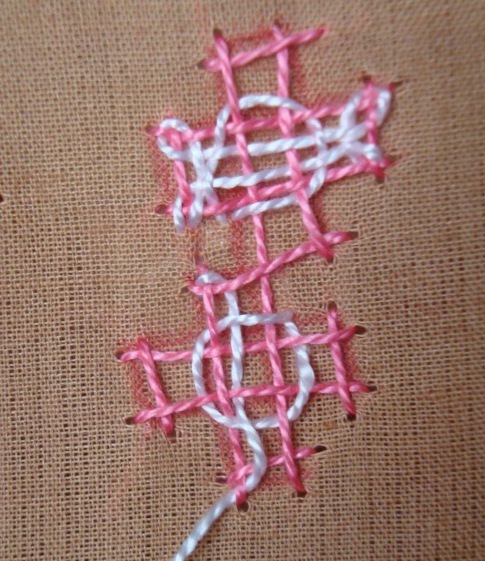 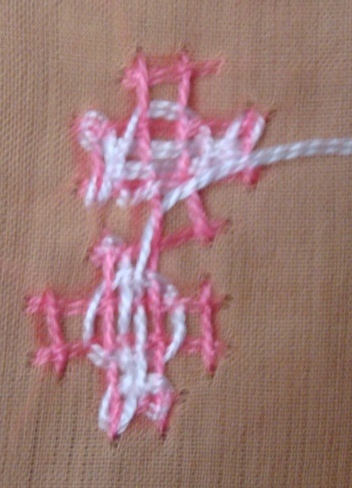 The base stitches[bands] are worked three steps. 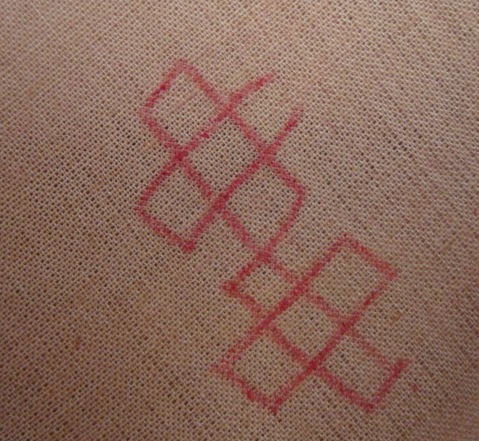 Two separate bands, and one connected band. 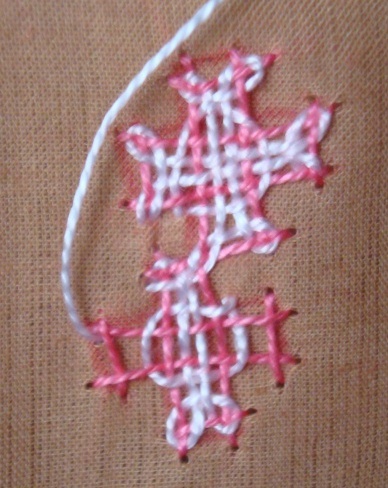 After completing each band, the thread goes back to the wrong side, and it is taken out at the starting point of the next band. 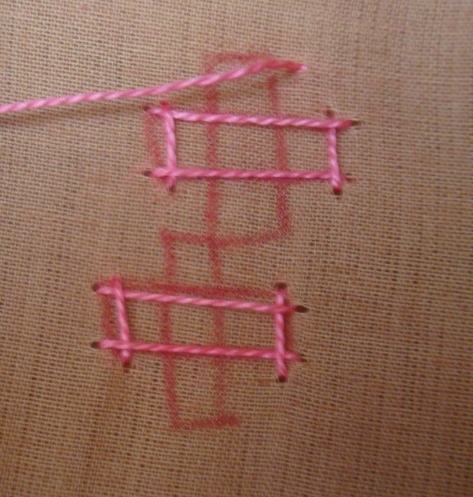 First step to start the weaving. 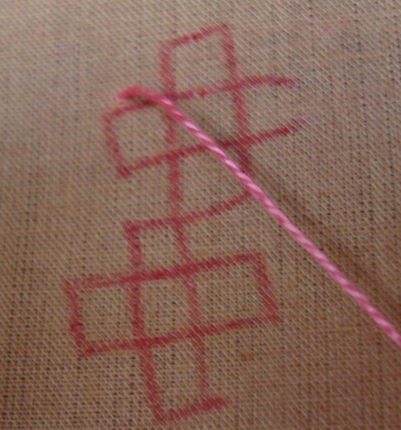 a two square journeys are required to be done around the two centre squares created by the bands. 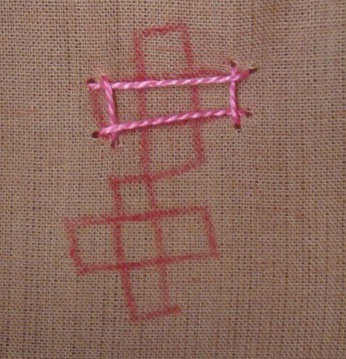 This journey helps in forming a line of thread on the outer squares. 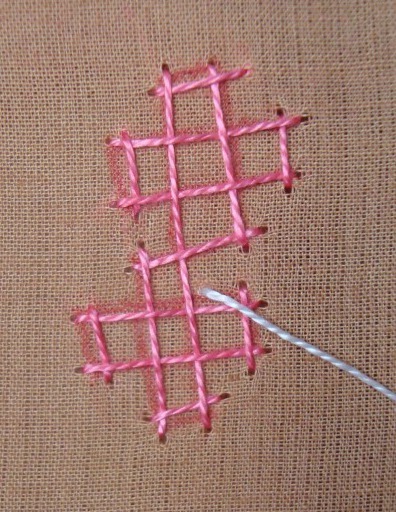 The first square is completed with the weaving thread. 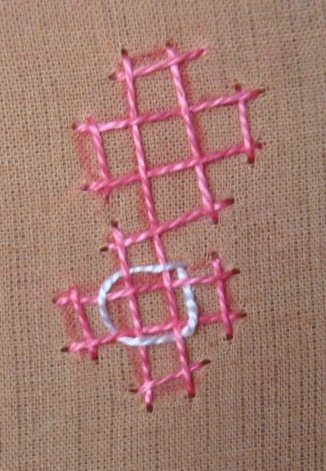 The movement of the second square lacing. 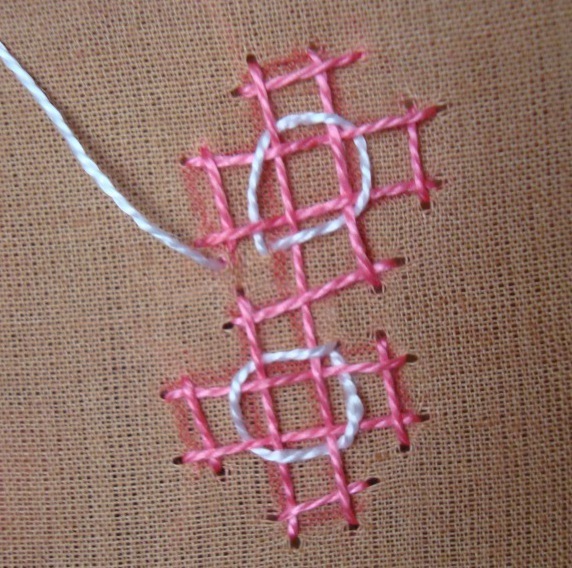 On my previous tutorials , the weaving steps were done elaborately, but in this tutorial I thought, whoever uses this should be having this basic idea of weaving. 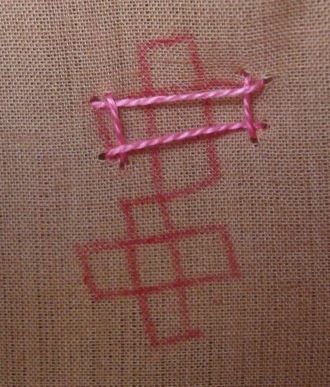 so, if anyone needs more clarification, they can leave their comments. 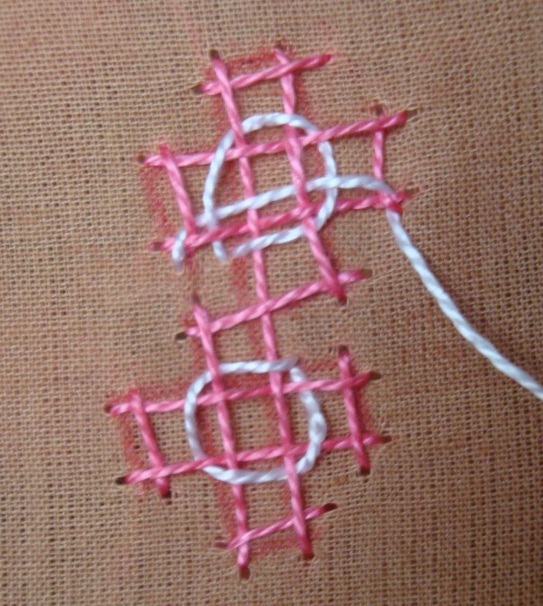 Hope this tutorial was useful! 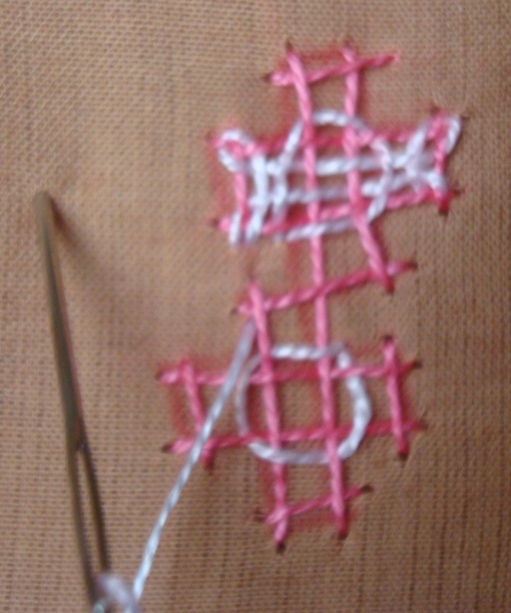 I’ll also be happy to see your projects, if you do any. 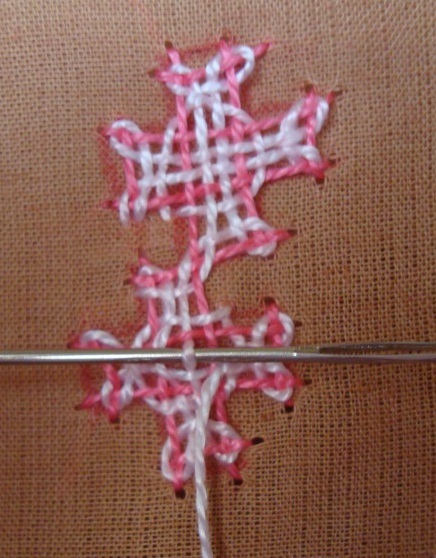 I’ll start working on the other two patterns in a short while. 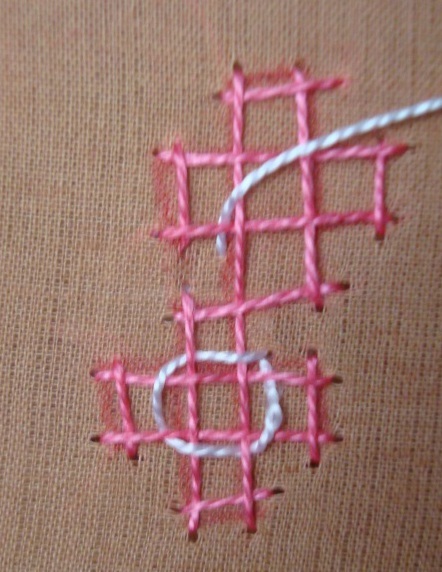 i ws looking for this specific kind of interlacing,thank u so much for posting, thanks again for posting mind boggling designs.